This site is dedicated to the parents who make the commitment to Breastfeed, and practice Attachment Parenting with their twins. While I was pregnant with my sons, I went surfing on the net to see what information was out there on Twins, Breastfeeding, and AP. I was frustrated at how difficult my search was. I learned that the information was available, but it was scattered under many topics. I designed this site hoping it would help the next person seeking Breastfeeding and Attachment Parenting Twins information. Update: Ahhhh....It is Autumn....And with the Autumn comes the lovely cool air, apple picking, and the beauty of our land changing into a rainbow of flaming reds, and brilliant golds. My boys are enjoying every minute of their days spent gathering acorns and colorful leaves. They turned three in July, and have started a nursery school program at the Nature Center here in my town. We are also attending a wonderful Mommy and Me program at a lovely Waldorf school a town away. With our days being full and active, my boys have little interest in nursing....All except for a snuggle right before bed. Things are feeling just right for us at the moment, and I could not be happier. I am very proud of the fact that we have maintained our nursing relationship into their fourth year of life. I feel truly lucky and blessed to be a mother. I have added a new Message Board for this site. I feel that this board will be easier to use than the last one we had. Please take a look and see what you think. Also, I have a new email addy that I am using for now. If you have emailed me over the past two or three months, I may not have received it. Please feel free to email me again. Last updated November 2, 2001. Come see the Breastfeeding Twins Gallery. There are many drawings of possible positions. Here are some links to people who have! This is my personal story, which I plan to update frequently. Here are a Mom and Dad of triplets! Their site has great multiples info, as well as tons of links to other parenting sites! A mom who nursed her twins for two years! An article from twinsmagazine.com by Sharon Withers. An amazing story of a mom who is breastfeeding her QUINTUPLITS! 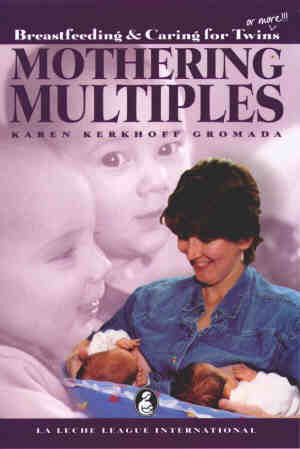 Mothering Multiples, by Karen Gromada, is the best book I have read as far as parenting twins goes. It covers real life situations, and deals with the "how toos" of breastfeeding beautifully. If you are new to the idea that you will have twins, or have been a parent of twins for a while, you will love this book. I read it when my boys were over a year old, and found it to be very helpful in giving me ideas when I was at my wits end. I highly recommend this book. Link from La Leche League, International. Link from Multiples FAQ's. Click FAQ's, and then click Breastfeeding Multiples. Link from Dialogue on Diarrhoea Online. Link from Royal Women's Hospital Breastfeeding Protocol. Can I Breastfeed Twins? How? Link from Dr. William and Martha Sears. How will I get sleep while breastfeeding triplets? Link by Dr. William and Martha Sears, from parenting.com. Link from Treasure Coast Triplet Club. Is Three a Crowd? Breastfeeding Triplets! Article by Carma Haley from Breastfeeding.com. Link from Association of Radical Midwives, radmid.demon.co.uk. Can A Mother Breastfeed Twins? Link from the Official Site of the National Organization of Mothers of Twins Clubs, Inc. Links to information on breastfeeding multiples in other languages. Click Here for translation to English. Cut and paste the URLs. Then click from Spanish, or Portuguese to English. You get the idea. Link from El Mundo de los Gemelos PR. Order this wonderful poster from INFACT. Link from Premature Baby-Prematue Child. Famous People who Breastfed Their Twins! How Much Money Are You Saving by Breastfeeding?? Visit Infant Feeding Costs to find out. Remember to multiply all the figures you see by 2. 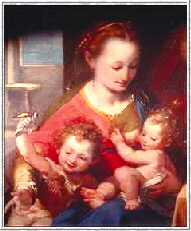 Or, do you know of a breastfeeding twins link that should be added? Copyright � 1999,2000,2001 BF&AP TWINS. All rights reserved world-wide.